Distracted driving - driving while not paying full attention to the road - is fast becoming one of the country's biggest safety concerns. 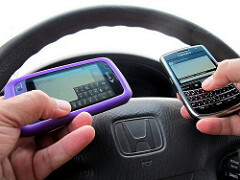 Mosaic Insurance would like to remind Prescott drivers to be a safe driver and avoid distracted driving. Distracted driving is all too common. Think about your daily commute. How many times have you looked over and seen people talking on their phones? Talking on phone while driving is a distraction. Even talking to a passenger in your car can be a distraction. You are distracted anytime your mind and/or your eyes are off the road. Texting while driving is one of the most dangerous things you can do. Even if it's just for a brief text, it can cause a deadly accident. When you send a text, you take your eyes off the road for about 5 seconds. According to the U.S. Department of transportation, that's the time it takes to drive the length of an entire football field when driving at 55 MPH! Putting on makeup, combing hair, etc. Distracted driving is dangerous and costs lives. It’s a growing epidemic, but its casualties could be reduced by careful drivers. Mosaic Insurance would like to remind Prescott drivers to avoid distracted driving and make sure you have the right auto insurance coverage. For a no-obligation review of your auto insurance, call Mosaic Insurance today at 928-458-7374.